Captain Britain Weekly | 'TAIN'T THE MEAT… IT'S THE HUMANITY! After a successful launch in 1972 Marvel’s UK subsidiary enjoyed a period of rapid growth that saw it quickly become one of the major players in the British comic book market. Repackaging their monthly American comics to fit the British model – weekly black and white anthology titles – had paid off proving there was an international market for their unique brand of superhero entertainment, and popular titles like The Mighty World of Marvel, Spider-Man Comics Weekly and The Avengers helped to solidify their market share. But by the mid-Seventies Marvel UK began to experience faltering sales caused in large part by Britain’s weak economy which forced the closure (or ‘merger’) of some of the publisher’s titles. By 1976 it had became clear that something had to be done to curtail this downward spiral and Marvel’s solution was a bold one: they would launch a weekly title featuring a new superhero created specifically for UK readers, the first time the US publisher had attempted such a feat. And unlike other Marvel UK titles this new comic would not consist of reprints but instead feature new stories created just for the UK market. Marvel showed its commitment to the new title by employing some of its heavy-weight US talent: writer Chris Claremont, whose Uncanny X-Men title was just beginning to break-out in the States and artist Herb Trimpe, who pencilled The Hulk for over seven years, were tapped to bring this new character to life. In the premiere issue the character’s backstory was fleshed out: Brian Braddock, an aristocrat who makes a living as a physicist, is given superpowers by Merlyn, King Arthur’s magician, and charged as Britain’s new champion. 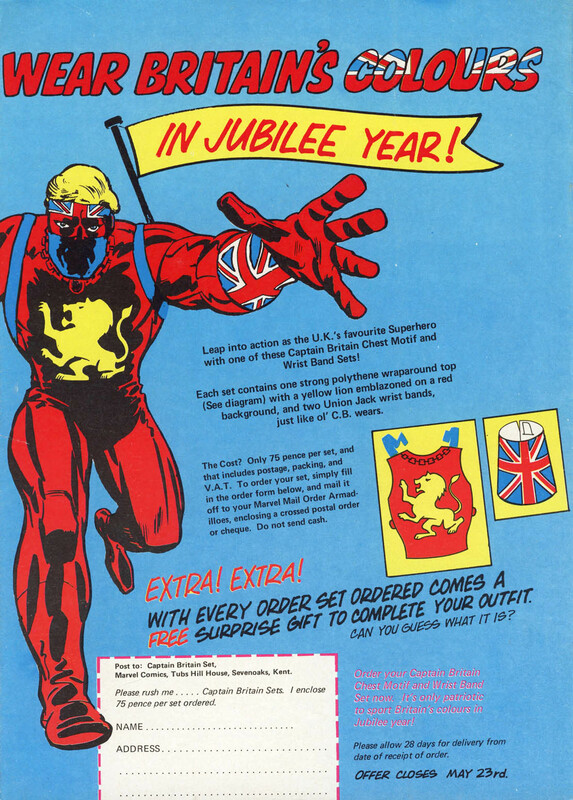 Adorned in an bright red costume replete with Union Jacks motifs and a heraldic lion Captain Britain was born. 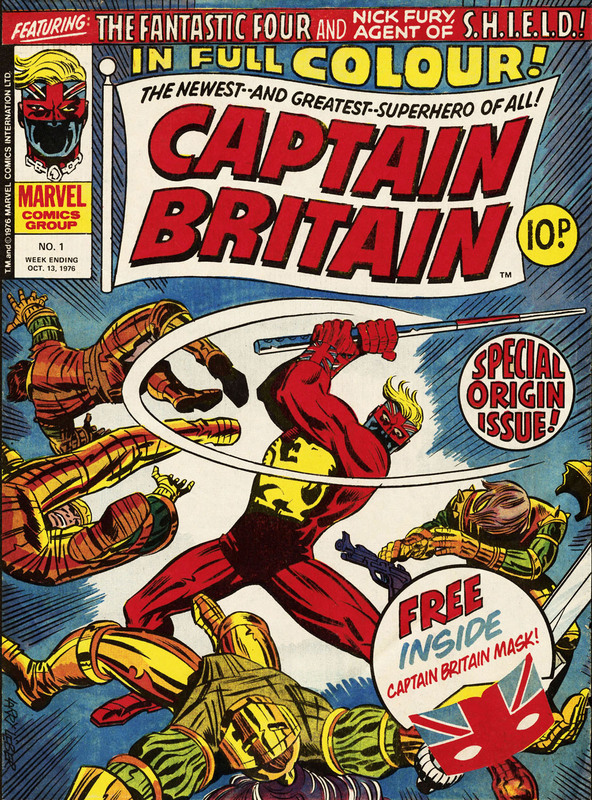 The first issue of Captain Britain Weekly was cover dated 13th October 1976, ran to 32 pages and sold for 10p. In addition to the Captain Britain story were two reprint stories: The Fantastic Four and Nick Fury, Agent of SHIELD. 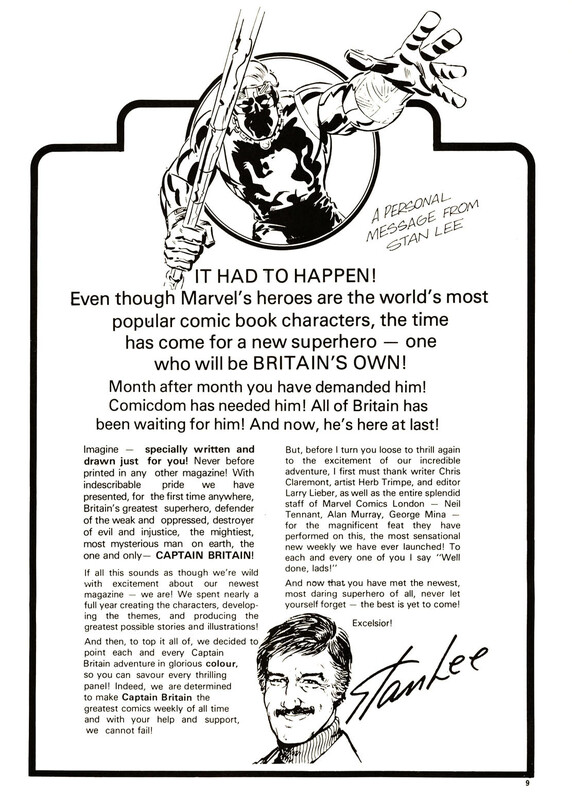 The first issue also included two Marvel Masterwork pin-ups, a puzzle page and, in keeping with other Marvel UK titles, a full-page ‘personal message’ by Marvel luminary Stan Lee, who welcomed readers to the first issue. Filling out the rest of the comic were five pages of adverts including one informing readers that Lee would be signing copies of Captain Britain Weekly as well as new reprint collection Bring On The Bad Guys at a bookshop in Charing Cross, London, with photographs from the event appearing in issue ten. Another British comics mainstay, the reader competition, was added in issue three (27th October 1976), while a page drawing readers attention to other Marvel UK titles (commonly known as Bullpen Bulletins in the US) was introduced in issue four (3rd November 1976). And with the addition of a letters page, Tell it to The Captain, in issue nine (8th December 1976) the format of the comic was now in place. During its 39 issue run minor changes were made to the title’s roster of stories. With issue 21 (2nd March 1977) Nick Fury was replaced by reprints from Marvel Team-Up, only to return three issues later pushing the total number of stories to four. This line-up would remain unchanged for the rest of the comic’s run with two exceptions: a one-off story featuring Howard The Duck which ran in issue seven (24th November 1976) and a story called The Hungry Jaws, which originally saw print in an 1952 issue of Uncanny Tales, which ran in issue 16 (26th January 1977). Writer Chris Claremont stayed with the title until issue 10 (15th December 1976) before being replaced by Gary Friedrich, who would co-write the Captain Britain strip with Marvel UK Editor Larry Leiber (brother of Stan Lee). From issue 38 (29th June 1977) the strip’s writing was shared by Bob Budiansky and Jim Lawrence, with Len Wein filling in for issue 37 (22nd June 1977). On the art side, Herb Trimpe would depart after issue 23 (16th March 1977) and was replaced by Marvel regular John Buscema, who in turn was succeeded by Ron Wilson in issue 31 (11th May 1977). 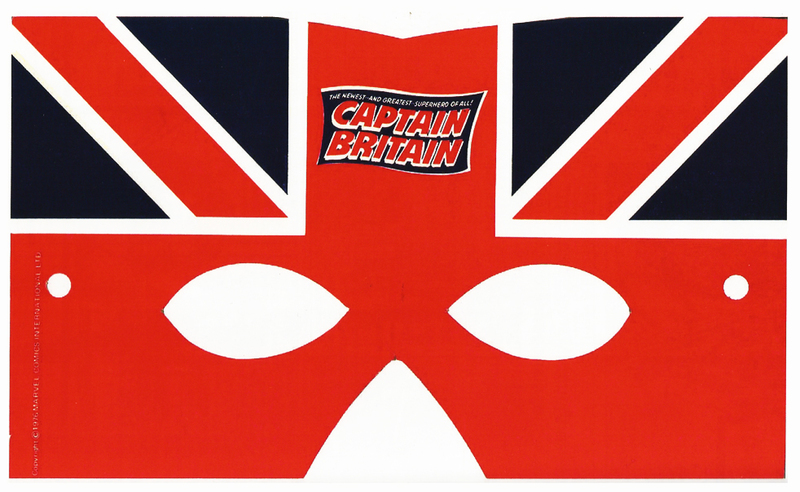 The overall editorial tone of Captain Britain Weekly mimicked the tried-and-tested brand of chatty banter familiar to readers of Marvel’s American comics, with UK readers referred to as ‘true believers’ or ‘heroes’. And in an attempt to underscore the uniqueness of the UK market the title followed Marvel’s policy of not advertising comics from its US stable of titles – only Treasury Editions or reprint books were advertised, as well as other Marvel UK comics. But despite Marvel UK’s best efforts to create a distinctly British superhero falling sales on the title, combined with increased printing costs, forced some changes to the title’s format. With issue 24 the page count was increased to 36 pages, a move welcomed by readers. Unfortunately this was done at the expense of the colour pages, which were dropped in the same issue (not a popular move judging by the complaints in the letters page). 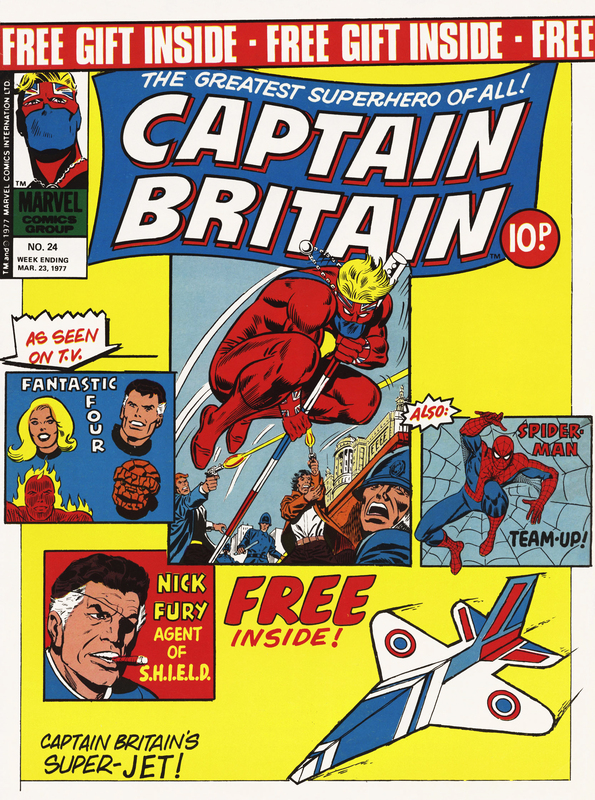 And Captain Britain himself now appeared to be taking a back seat in his own strip, with Captain America (first seen in issue 16, 26th January 1977), and then Nick Fury, taking more of a leading role than the eponymous hero. Sales continued to fall and by the Summer of 1977 it was clear that, despite being created specifically for the UK market, the character had failed to resonate with British readers. The writing was on the wall for the faltering title and it was cancelled with issue 39 (6th July 1977). 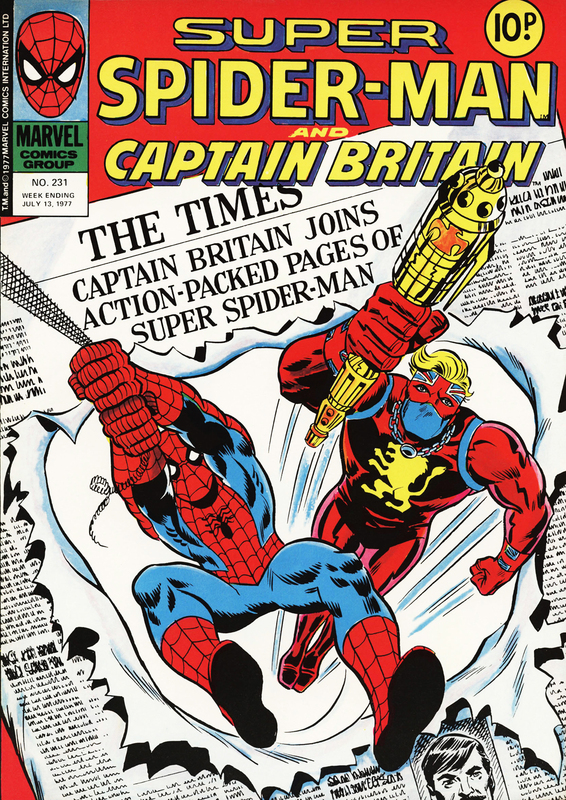 As was typical of failed Marvel UK comics it didn’t disappear completely but was merged with Super Spider-Man and The Titans, issue 231 (13th July 1977) a week later to form Super Spider-Man and Captain Britain. The strip still featured original stories with Lieber now plotting alongside writer Jim Lawrence while Ron Wilson and Pablo Marcus shared art duties. 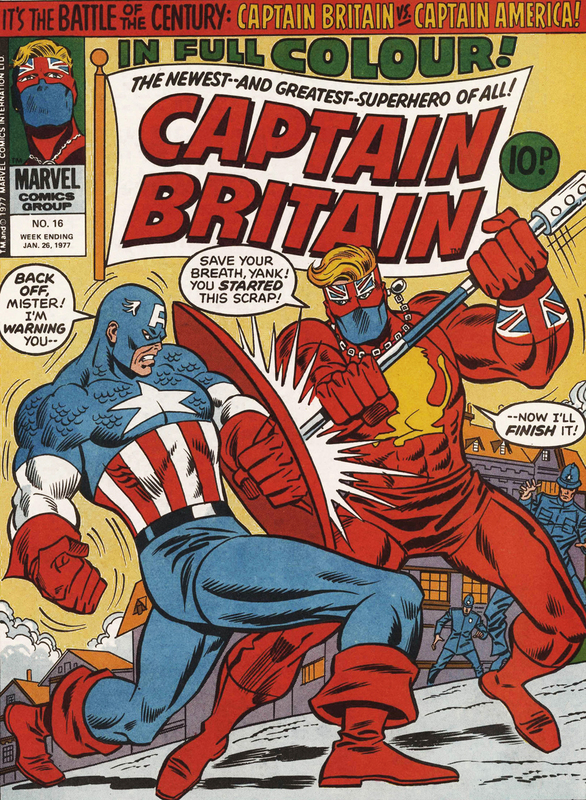 Despite sharing headline billing on the weekly title Captain Britain only featured on five covers, and on four of those he only appeared in a bottom corner slot. 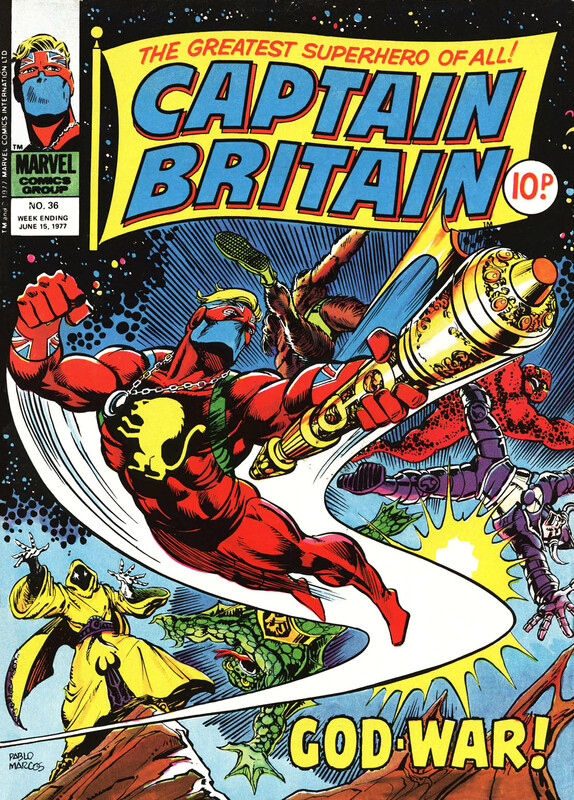 Marvel UKs first experiment in creating new and exclusive content aimed specifically at UK readers came to a quiet end with Super Spider-Man and Captain Britain issue 247 (2nd November 1977), the last issue to feature new Captain Britain material. The following six issues featured the character in a reprinted story taken from Marvel Team-Up issues 65 and 66, written by Chris Claremont (in a sad case of symmetry) and pencilled by John Byrne, before Captain Britain was finally dropped from the comic with issue 253 (14th December 1977) with the title now renamed Super Spider-Man. But despite the lack of his own weekly title it looked as if British readers weren’t done with their namesake hero. 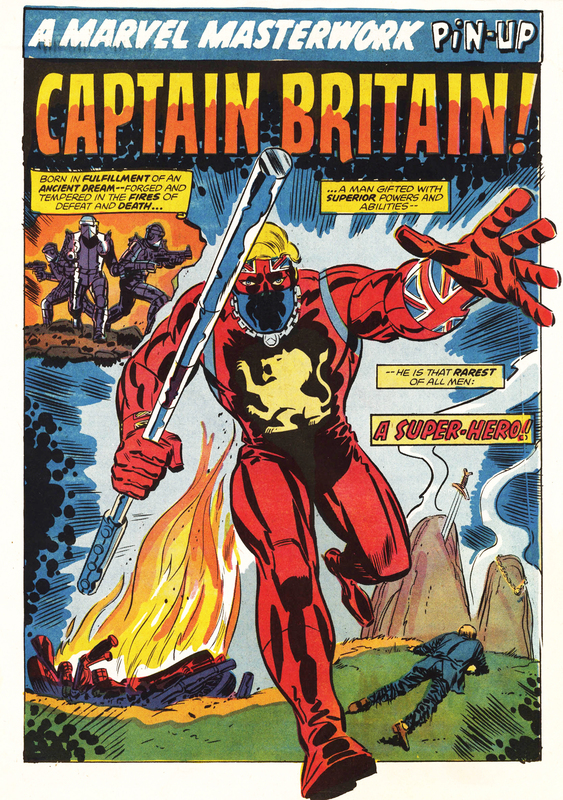 Reprints from his weekly comic were repackaged for a Captain Britain 1978 Annual and two Summer Specials, and he appeared in the Black Knight strip that ran in the weekly Hulk Comic throughout most of 1979. In 1981 his popularity was such that he was given a new costume and relaunched in Marvel Superheroes issue 377 (September 1981), where he would quickly fall under the influence of upcoming writer Alan Moore who would help steer the character’s resurgence.